<p>Featuring five outstanding artists whose recoginzed skills highlight the excellence of own of Ballet and Theatre Companies, our Philharmonic Orchestra and Art Center. 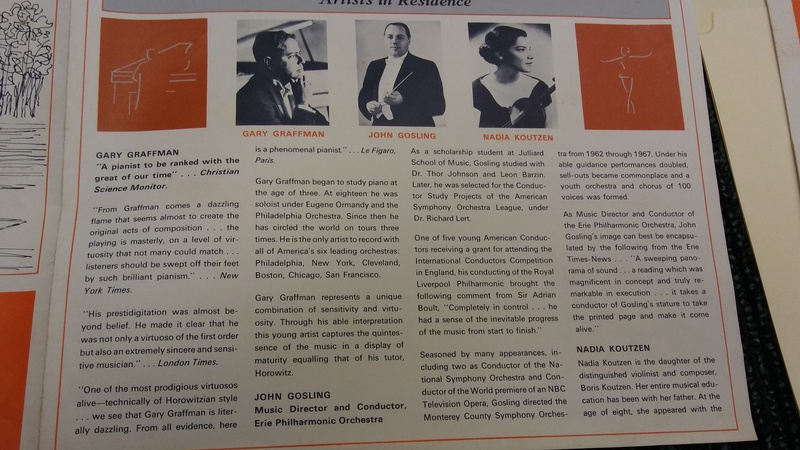 The First Annual Erie Summer Festival of the Arts also give serious students a gloden opportunity to further their education through a program of workshops conducted by <persName ref="#Gary">Gary Graffman</persName>, pianist,<persName ref="#Violette">Violette Verdy</persName>, Ballerina, <persName ref="#John">John Gosling</persName>, Music Director of the Erie Philharmonic and <persName ref="#Statia">Statia Sublette</persName> and other artists of the Erie Ballet Company, all of whom will take part in the workshops. Rounding out the Summer Festival will be a two-phase program presented by the Erie Art Center. 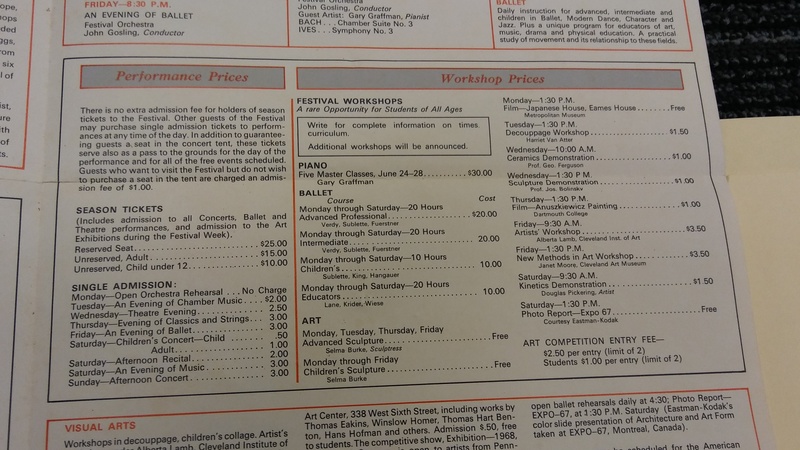 First phase of the program will be Exibition-<date when="1968">1968</date>, a competitive show to be judged by <name xml:id="Robert" role="Director">Robert McCullough</name>, Director, Clevand Institute of Art. <persName ref="#Robert">Mr. 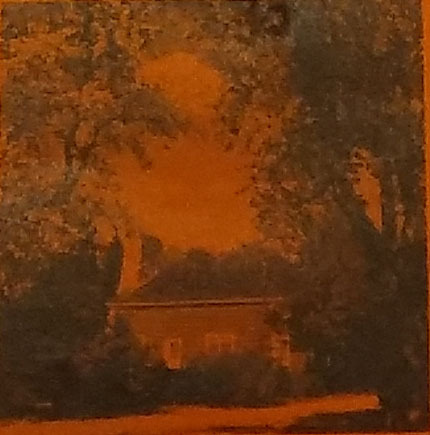 McCullough</persName> presence and generous prize list are expected to attract artists from all over northeastern United States. Second phase of the Art Center Program of the Art Center Program will be a display of famous American paintings which can be viewed by the public throughout the week of the Festival at the Art Center, 338 West Sixth Street. Site of the Festival will be spacious, Behrend Campus, rolling acres of verdant lawn and majestic trees. In keeping with the relaxed, informal outdoor atmosphere will be the tent, seating 1000 people, in which performance will be given. You are cordially invited to bring a pinic lunch of supper any day. 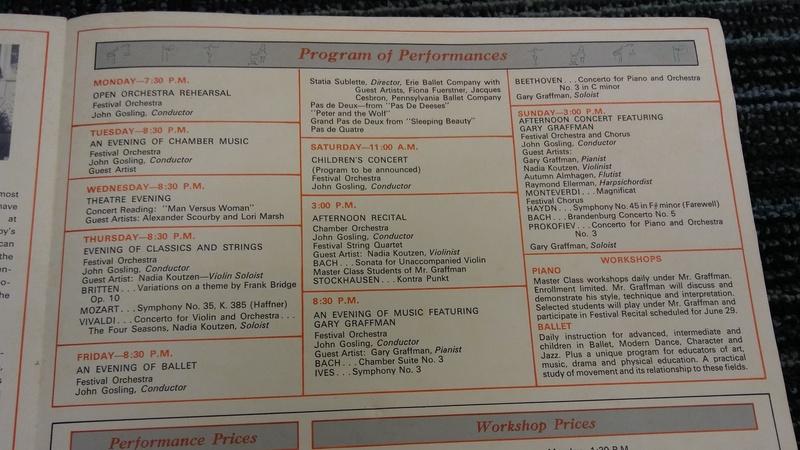 Beverages and home-made desserts will be avaliable from Tuesday evening, <date when="1968">June 25</date> through Sunday, <date when="1968">June 30.</date> A Festive Pinic Box may be ordered for Sunday afternoon, <date when="1968">June 30,</date> replacing a reservation by Saturday afternoon, at the Refreshment Tent. As a resort city Erie offers complete, all-round vacation facilities to arts enthusiasts and their families. Erie is the home of famous Presque Isle State Park, a resort center that attracts three million vistors each year. Presque Isle is a curved, finger of land that reaches into Lake Erie to form the finest natural harbor on the Great Lakes. Within the harbor are over <num>4,0000</num> acres of excellent fishing and boating water. On the lake side of Presque Isle over <num>7</num> miles of prime, sandy beaches offer swimming in reqularly tested, fresh water. There are <num>8</num> guarded swimming beaches, boat ramps, and liveries, and complete picnic facilities. Admission to Presque Isle is free. There are dozens of other things to do and see in Erie and Erie County. 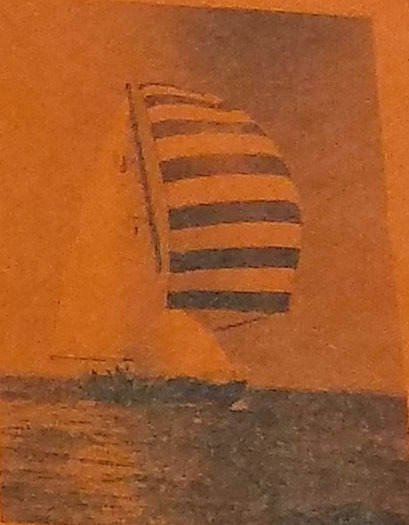 Therea re three beautiful inland lakes, <num>40</num> miles of Lake Erie shoreline, miles of streams for swimmers, boatsmen, water skiers and fishermen. 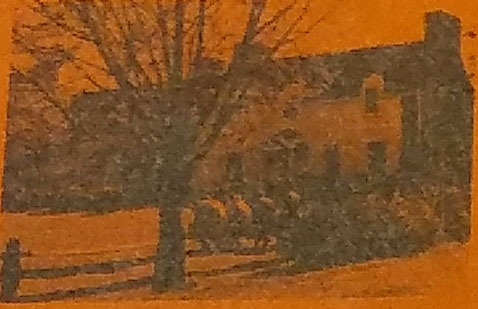 Historical sites such as <list><item>Perry's Flagship the Niagara  artifact from the war <date when="1812">1812</date>,</item><item>a modern zoo,</item> <item>excellent golf courses,</item><item>a fine museum,</item> </list> things for the entire family to see, do and enjoy. Beacause it is <q>Pennsylvania's Vactionland</q> Erie County has an excellent selection of accommodations for lodging and dining. performance and for all of the free events scheduled. 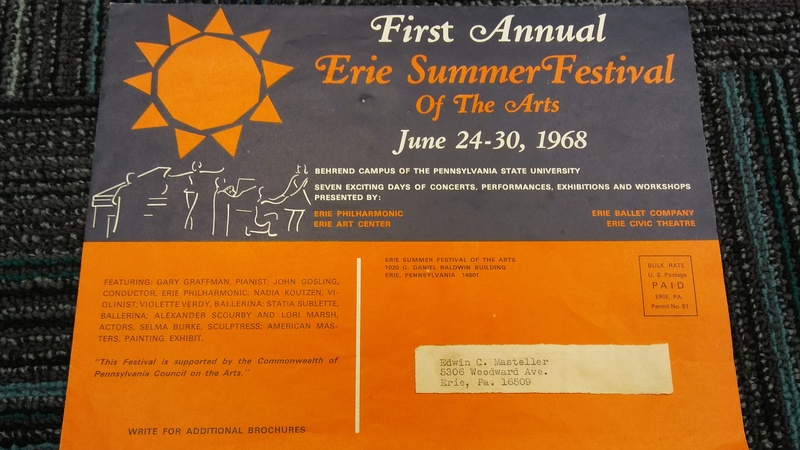 First Annual Erie Summer Festival of The Arts June 24-30 1968 Behrend Campus of the Pennsylvania State University Kyler Raines Behrend Campus. This is a project for Pennsylvania State University- Behrend DIGIT 110 Project. Featuring: Erie Philharmonic: This Festival is supported by the Commonwealth of Pennsylvania Council on the Arts. Featuring five outstanding artists whose recoginzed skills highlight the excellence of own of Ballet and Theatre Companies, our Philharmonic Orchestra and Art Center. The First Annual Erie Summer Festival of the Arts also give serious students a gloden opportunity to further their education through a program of workshops conducted by Gary Graffman, pianist,Violette Verdy, Ballerina, John Gosling, Music Director of the Erie Philharmonic and Statia Sublette and other artists of the Erie Ballet Company, all of whom will take part in the workshops. Rounding out the Summer Festival will be a two-phase program presented by the Erie Art Center. First phase of the program will be Exibition-1968, a competitive show to be judged by Robert McCullough, Director, Clevand Institute of Art. Mr. McCullough presence and generous prize list are expected to attract artists from all over northeastern United States. Second phase of the Art Center Program of the Art Center Program will be a display of famous American paintings which can be viewed by the public throughout the week of the Festival at the Art Center, 338 West Sixth Street. Site of the Festival will be spacious, Behrend Campus, rolling acres of verdant lawn and majestic trees. In keeping with the relaxed, informal outdoor atmosphere will be the tent, seating 1000 people, in which performance will be given. You are cordially invited to bring a pinic lunch of supper any day. Beverages and home-made desserts will be avaliable from Tuesday evening, June 25 through Sunday, June 30. A Festive Pinic Box may be ordered for Sunday afternoon, June 30, replacing a reservation by Saturday afternoon, at the Refreshment Tent. As a resort city Erie offers complete, all-round vacation facilities to arts enthusiasts and their families. Erie is the home of famous Presque Isle State Park, a resort center that attracts three million vistors each year. Presque Isle is a curved, finger of land that reaches into Lake Erie to form the finest natural harbor on the Great Lakes. Within the harbor are over 4,0000 acres of excellent fishing and boating water. 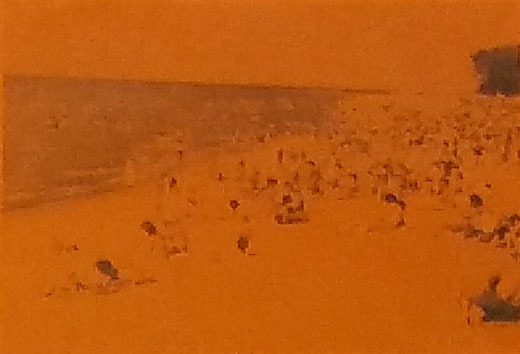 On the lake side of Presque Isle over 7 miles of prime, sandy beaches offer swimming in reqularly tested, fresh water. There are 8 guarded swimming beaches, boat ramps, and liveries, and complete picnic facilities. Admission to Presque Isle is free. There are dozens of other things to do and see in Erie and Erie County. Therea re three beautiful inland lakes, 40 miles of Lake Erie shoreline, miles of streams for swimmers, boatsmen, water skiers and fishermen. Historical sites such as Perry's Flagship the Niagara artifact from the war 1812, a modern zoo, excellent golf courses, a fine museum, things for the entire family to see, do and enjoy. Beacause it is Pennsylvania's Vactionland Erie County has an excellent selection of accommodations for lodging and dining. There are 90 motels in Erie with mroe than 2,000 indivdual room units. Special arrangements have been made for students attending Festival workshops to stay at private homes in the Behrend Center area at nominal charges. Should you desire reservations or additional information about accomonodations recreational facilities, Festival workshops or any phase of the Festival Program, please use the coupon included in this brochure. Or write Erie Summer Festival of the Arts 1020 G. Daniel Baldwin Bldg., Erie Pa, 16501. Gary Gaffman began to study piano at the age of three. At eighteen he was soloist under Eugene Ormandy and the Philadelphia Orchestra. Since then he has circled the world on tours three times. He is only artist to record with all of America's sic leading orchestras; Philadephlia, New York, Cleveland, Boston, Chicago, San Franciso. Gary Gaffman represents a unique combination of sensitivity and virtuosity. Through his able interpretation this young artist captures the quintessence of the music in a display of maturity equalling that of his tutor, Horowitz. As a scholarship student at Juliard School of Music, Goslingstudied with Dr. Thor Johnson and Leon Barzin. Later he was selected for the Conductor Study Projects of the American Symphony Orchestra League, under Dr. Richard Lert. One of five young American Conductors receiving a grant from attending the International Conductors Competition in England,his conducting of the Royal Liverpool Philharmonic brought the following comment from Sir Adrian Boult, Completely in control...he had a sense of the inevitable progress of the music from start to finish. Seasoned by many appearances, including two as Conductor of the National Symphony Orchestra and Conductor of the World premiere of an NBC Televison Opera. Gosling directed the Monterey County Symphony Orchestra from 1962through1967.Under his able guidance performance doubled, sell-ours became commonplace and a youth orchestra and chorus off 100 voices were formed. As Music Director and Conductor of the Erie Philharmonic Orchestra, John Gosling's image can best be encapsuiated by the following from the Erie Times-News... A sweeping panorama of sound...a reading which was magnificent in concept and truly remarkable in execution...it takes a conductor of Gosling'sstature to take the printed page and make it come alive. Statia Sublette, guest artist and Director of the Erie Ballet Company, studied balled in Copenhagen, Denmark and other international schools. Her background includes ballet seminars in Copenhagen, a season in Havana,Cuba, and at Jacob's Pillow, School of American Ballet and Ballet Repertory. She is presently teaches in her own schools in Erie Pennsylvania and Youngstown, Ohio. Miss Sublette recently participated in full lenth Nutcracker ballet productions in Ohio, New York, Pennsylvania. Earlier in the 1967 season she appeared with dancers from the Boston Ballet Company with excellent reviews. 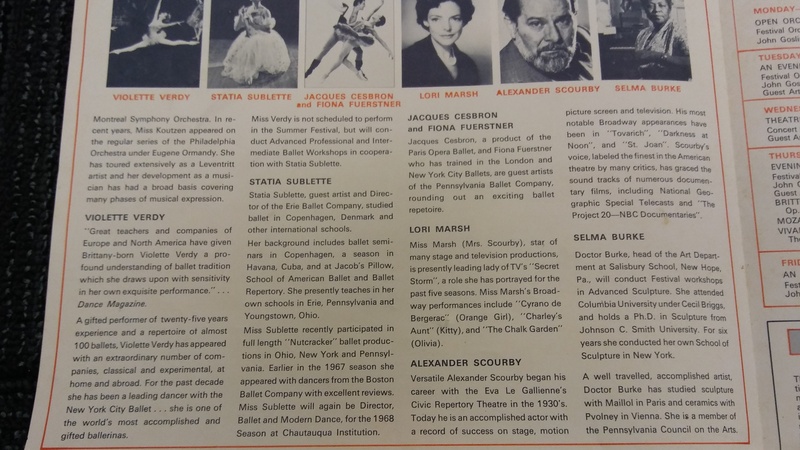 Miss Sublette will again be Director, Ballet and Modern Dance, for the 1968 Season at Chautauqua Institution. Jacques Cesbron, a product of the Paris Opera Ballet, and Fioana Fuerstner who has trained in London, New York CityBallets, are guest artists of the Pennsylvania Ballet Company, rounding out an exciting ballet repetorie. Miss Marsh (Miss Scourby), star of many stage and televison productions, is pressently leading lady of TV's Secret Storm , a role she had portayed for the past five seasons. Miss Marsh's Broadway performances include Cyrano de Bergerac (Orange Girl), Charley's Aunt (Kitty), The Chalk Garden (Olivia). Versatile Alexander Scourby began his career with the Eva Le Gallienne's Civic Repertory Theature in the 1930's. Today he is an accomplished actor with a record of success on stage, motion picture screen and televison. He most notable Broadway apperances have been in Tocarich , Darkness at Noon , and St Joan . Scourby's voice, labeled the finest in the American theatre by many critics, had graced the sound tracks of numerous documentary films, including National Geographic Speical Telecasts and The Project 20-NBC Documentaries . A well travelled, accomplished artist, Doctor Burke had studied sculpture with Mailol in Paris and ceramic with Pvolney in Vienna. She is a member of the Pennsylvania Council on the Arts. In 1950, under Fritz Mahler, the Philharmonic received special recognition when invited to perfrom on NBC's Pioneers of Music network. James Sample directed the group from 1953 to 1967 with season after season of success and growth. 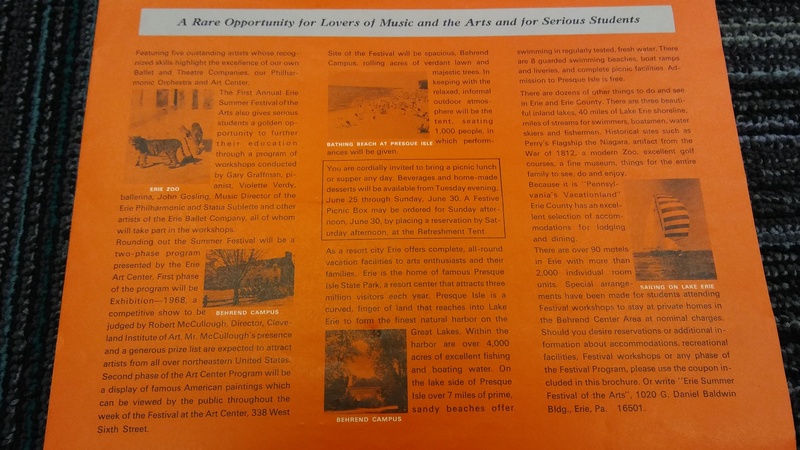 Sample's contribution to the Erie community was recognized when Gannon College congerred an honorary degree of Law and Letters on him in 1963. Under its present Music Director and Conductor, John Gosling, the Erie Philharmonic has attained the status Metropolitan Symphony Orchestra. It now ranks with 80 such orchestras in the nation as recognized by the American Symphony Orchestra League. Although young in years, the Erie Ballet Company enjoys and enviable reputation. The company this year is observing the 10th anniversary of its founding. In the time it has produced almost 50 ballets. Under the professional instruction of the its founder Statia Sublette, the Erie Ballet Companyhas produced dancers for the Royal Dansish Ballet, the New York City Ballet, and the performing companies of Butler and Utah Unviersities. This past season the Erie Ballet Compan performed in St. Louis, Clevland, Detorit, Pittsburgh, Buffalo, and Princeton. As an honor comany of the Northeast Region, it has performed in Ottawa, Canada; Washington, D.C; Scranton, Pa. and Wabash, Indiana. Erie Playhouse, recognized as one of the oldest and finest community theatres in the country, has been a training ground for many of the greatest name in the theatre and on televison. It now combines community theatre with professional staff and casting for the highest standards of entertainment, education and culture. Its history dates back to 1916 when it was founded by Henry B. Vincent, famed as a pianist, organist, composer, and conductor. The Playhouse acheived its most prominent success and national status under L. Newell Tarrant who was director from 1946 to 1961. The present director William Cohen, was formerly Tarrant'sassistant. 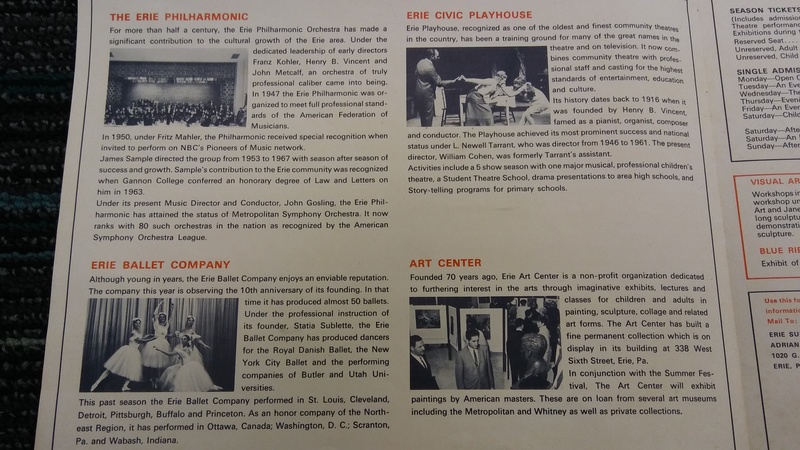 Founded 70 years ago, Erie Art Center is a non-profit organization dedicated to furthing interest in the arts through imaginative exhibits, lectures, and classes for children and adults in painting, sculpture, collage and related art forms. The Art center has built a fine permanent collection which is on display in its building at 338 West Sixth Street, Erie, PA. In conjuction with the Summer Festival, the Art Center will exhibit paintinigs by American masters. These are on loan from several art museums including the Metropolitian and Whitney as well as private collections. There is no extra admission free for holders of season tickets to the Festival. Other guests of the Festival may purchase single admission tickets to perform- ances at any time of the day. In addition to guaranteeing guests a seat in the concert tent, these tickets serve also as a pass to the grounds for the day of the performance and for all of the free events scheduled. Guests who want to visit the Festival but do not wish to purchase a seat in the tent are charged an admission fee of $1.00. Workshops in decouppage , childrens collage. Artist' workshop under Alberta Lamb, Cleveland Institute of Art and Janet Moore, Clevand Art Museum. Week-long sculpture workshop for children. 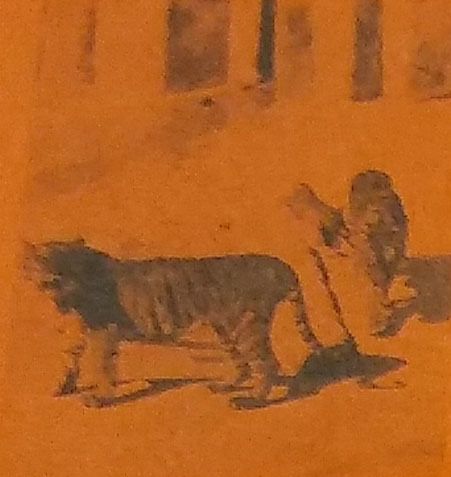 Films, lectures, demonstrations in paintings, kinetics, photography, sculpture. Exhibit of American Masters paintings, at the Erie Art Center, 338 West Sixth Street, including works by Thomas Eakins, Winslow Homer, Thomas Hart Benton, Hans Hofman and others. Admission $.50, free to students. The competitive show, Exhibition-1968, at Behrend Campus, is open to artists from Pennsylvania, New York and Ohio, with $1,300 in prizes and a special category for high school and college students. Admission free to the public. You are invited to attend the following free activities: two open orchestra rehearsals June 24th and 30th; open ballet rehearsals daily at 4:30; Photo Report-EXPO-67, at 1:30 P.M. Saturday (Eastman-Kodak's color slide presentation of Architercture and Art Form taken at EXPO-67, Montreal,Canada). Guided tours may be scheduled for the American Masters exhibit by any group. To do so, contact the Art Center, 338 West Sixth Street, Erie, at least 10 days in advance. Festival Program subject to change. Featuring: Gary Graffman John Gosling Erie Philharmonic: Nadia Koutzen Violette Verdy Statia Sublette Alexander Scourby and Lori Marsh Selma Burke American Masters This Festival is supported by the Commonwealth of Pennsylvania Council on the Arts. Powered by TEI Boilerplate. TEI Boilerplate is licensed under a Creative Commons Attribution 3.0 Unported License.